The Republican who hopes to follow in the current governor's footsteps banks on his proven entrepreneurial ability and a life story built on success. GORHAM — Shawn Moody built an auto repair business from nothing, transformed a junkyard into a state-of-the-art auto recycling facility that he sold for millions, and spread his namesake collision centers across the southern half of the state. Now he’s the Republican nominee for governor, having easily won a four-way primary in which he vanquished a powerful government commissioner, the Senate majority leader and the House minority leader, putting the keys to the Blaine House within reach. Little-known fact: He’s an avid pilot. This is the first of four profiles of the 2018 candidates for governor. None of this might have happened had his cousin Peter Hooper not crashed on his mother’s couch in the summer of 1971, the summer Hooper’s ’66 Corvette broke down. So it was to Corvettes Shawn would turn the following year when his life turned upside down, his mother institutionalized and then unable to work; their move to a trailer park, where more money was needed to keep afloat. He started helping out at a garage that repaired them on weekends and after school. He was good at it, so good that at 17 he was repairing cars of all sorts out of his own purpose-built garage, the entrepreneurial kernel from which a business empire, a modest fortune, and two bids for his state’s highest office would grow. 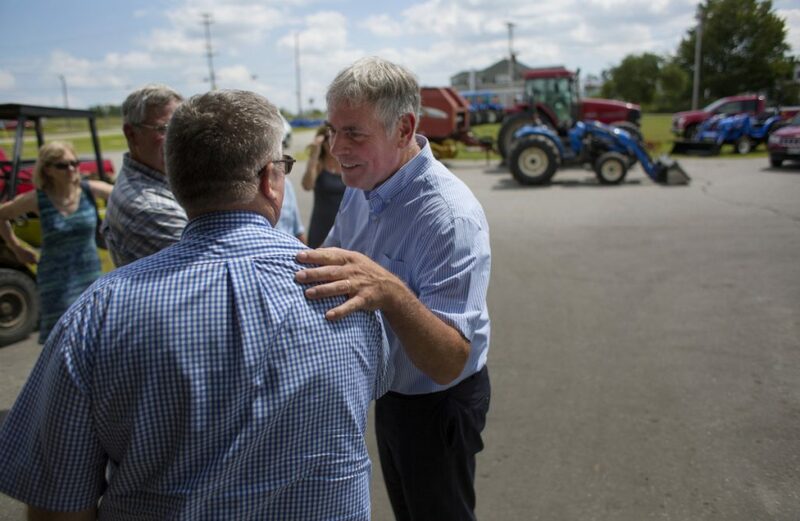 Moody, 58, crushed three experienced rivals to win the Republican gubernatorial primary in June, less than nine months after joining the party. He’s never held elected office, running instead on his record as an entrepreneur who built successful businesses from nothing and a pledge to carry on the legacy of incumbent Gov. Paul LePage, whose daughter and key advisers joined his campaign early on. His campaign website promises he would further reduce government waste and red tape, reduce spending and income taxes, crack down on welfare fraud and test recipients for drugs, place armed officers in schools, and block public funding for abortions. He wants to help the federal government crack down on illegal immigration by banning sanctuary cities and would improve young Mainers’ job prospects by ensuring public schools and universities have timely, career-oriented course offerings. The youngest of three children, Shawn Hoyt Moody was born Oct. 24, 1959, in Gorham, a blue-collar and farming town of 5,700 where all his grandparents were raised. His father, Winship Moody, was the son of a successful paper salesman and had graduated from the University of Maine’s pulp and paper management program. His mother, Ann Bachelder, was from a long line of tradespeople, a high school basketball star who’d been crowned 1951 Maine Apple Queen at the Agricultural Trades Show and was Maine’s “princess” at that year’s Cherry Blossom Festival in Washington, D.C. She became a cosmetologist, like her mother before her. 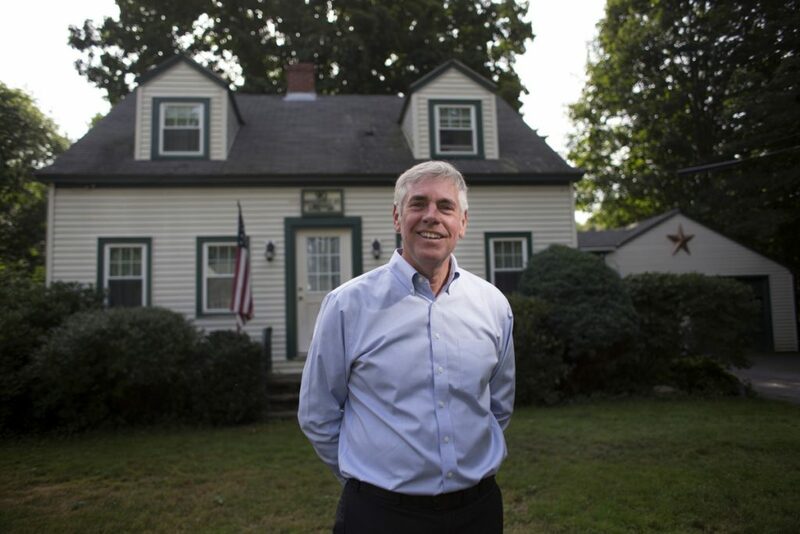 Shawn Moody, the Republican candidate in a four-way race for governor, stands outside his boyhood home on Narragansett Street in Gorham, where his brother Thad still lives. Because of family circumstances for a short while when he was 12, Moody had been left by himself at the home, a fact he kept hidden at the time. His parents divorced when Shawn was 1. His father moved to Massachusetts, paid his child support, and eventually rose to become president of the American Pulp and Paper Manufacturing Association, and CEO and controlling stakeholder in the Rice Barton Corp., a Worcester manufacturer of paper machinery. His mother struggled to keep the family afloat as a self-employed beautician while coping with mental health issues that would result in her being twice hospitalized. Shawn looked up to his older brother, Thad, six years his senior, as a father figure who he thought “kind of walked on water.” He hung around with Thad’s friends, older kids who got him thinking about jobs, money, cars, and even real estate years ahead of his peers. When he was 7, he and Thad spent the summer with his aunt and uncle. When they returned home, Shawn says he could see a very visible difference in his mother. She had spent the summer as an inpatient at the Augusta Mental Health Institute. They moved into a little cape with an attached garage on Narragansett Street – Route 202 – a low-density residential neighborhood with a large junkyard and the Gorham Raceway, a popular harness racing track. (Today the house belongs to Thad, the 62-acre raceway property to Shawn, who intends to develop it as a business park.) By 10, Shawn was getting on his bike early each morning to deliver the Portland Press Herald, often finishing in time to hitch rides on the horse-drawn sulkies at the track. The summer he was 11, cousin Peter Hooper lived with them, sleeping on the couch, parking his ’66 Corvette in the driveway. Then the car broke down and Peter’s friends were there fixing it, men in their early 20s like Harold Hawkes (who now owns the Gorham Country Club) and Peter Caruso (now president of Maine Aviation Inc., the Standish aircraft brokerage.) Shawn loved it. But the following spring, Shawn was living in the house alone. His sister was on a student exchange trip to Norway, his brother Thad had moved out, and his mother had been readmitted to AMHI. 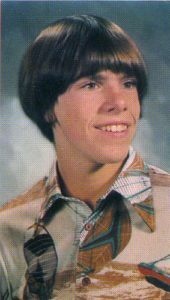 Most of the adults in his life were unaware that 12-year-old Shawn had been left on his own, and he was afraid to tell anyone. His mother returned a month later, unable to work. She’d received electric shock treatments and Thorazine, Moody says. “It wasn’t pretty. You see somebody you love and see them incapacitated, it’s tough,” he says. They rented out their house and moved to the trailer park on Libby Avenue. Making money now seemed much more important than playing sports, and working on Corvettes seemed like a dream job, so he started working at Ron’s Corvette Sales after school and on weekends. He was good at it, and was soon making more than twice the minimum wage, serious money for a high school freshman. With the help of employers, family, and friends, he dove headlong into the vehicle mechanic’s world. At 14, he rebuilt a 450-horsepower V8 in the garage of his mother’s rented house and installed it in an engine-less 1969 Chevelle, which gave him what may have been the fastest, coolest car at Gorham High School before he even had a license to drive. His mother would drive him to Hollis so he could help his cousin Goodwin Hannaford build engines for Maine stock-car racing legend Homer Drew. A second employer, Roger Hanscom of Hanscom’s Body Shop, gave him a complete set of tools for his 15th birthday. In 1975, his mother married Clint Allen, the owner of the junkyard down the street, and they moved in with him. The marriage lasted less than a year. One morning at the kitchen table, his mother told Shawn it wasn’t working out and that they would move to a Portland apartment. “That was a decision point,” he recalls. “I loved my mom, but I had a good job going, I had school and friends, and she understood.” His mother moved out; Shawn stayed with the help of his father, who paid Allen $100 a month as rent for the 16-year-old’s room. Allen died in 1990 at age 64. Shawn’s mother died in 2016 at age 83. The summer before his senior year, Moody made his landlord and ex-stepfather a proposition: Sell me an undeveloped quarter-acre parcel on the far side of your junkyard. Allen demurred, but Moody kept after him until he relented. He bought the lot for $1,000 and managed to secure a $6,000 loan from a local bank where one of his aunts worked. With that and the rest of his savings he built a three-bay commercial garage. By October he had his own car repair business. He was a few weeks shy of his 18th birthday. Shawn Moody’s photo from the Gorham High School 1978 yearbook shows a young man already active in business. Moody appeared before the planning board and was stunned to find a platoon of local luminaries had come to town hall to speak in support of his request for a variance, including Eastman, Police Chief Edmund Hagan and dairy farmer Dewayn Shaw, whose sons had gone to school with Moody and had just founded their own business, the Shaw Brothers construction firm. By 1981, Moody had paid off his debts and saved enough to buy a second location, a garage just off Main Street. To save money, he fixed up a small, uninsulated room for himself and moved in, relying on a kerosene heater for warmth. That was when he met his future wife, Christina Stevenson – a recreation director at Goodwill Industries who worked with cognitively challenged and disabled adults – while repairing her car. Dates would consist of going on field trips with her clients or taking his truck to tow a car after work. “I could see he was really trying to make something, and he was hard-working and loyal and just fun to be around,” Christina says. “She was such a positive influence in my life, because I was going in a gear where I don’t know if I would have slowed down enough to raise a family,” Moody says. “And I fell in love, and she could get me to do things that I didn’t think I’d ever do and got me into this area of life that’s been so fulfilling and gratifying.” They married in 1987, moved into the house they’ve lived in ever since two weeks later, and where they would raise four children. “As hard as he’s worked at the business, he worked equally hard at being a good father and husband and a member of his family with his brother and sister and mom,” Christina adds. Shortly thereafter, Clint Allen agreed to sell Moody his entire junkyard, owner-financed, for $250,000. The 28-year-old set out to turn the decrepit junkyard into a state-of-the-art automobile recycling operation where he would make his millions. His father’s brother, Jim Moody, the CEO of Hannaford Supermarkets and board chairman of Bates College and the Food Marketing Institute, had put a bug in his ear about the importance of learning from the wider world. Uncle Jim told him how he’d gone to the West Coast to learn about the new bar-code reading technology, then brought it back to New England where it gave his company – whose founders were unrelated to Shawn’s mother’s family – a competitive edge. The younger Moody took this to heart, joining peer groups that traveled to other, noncompeting parts of the country to share financials, marketing strategies and best practices with others in the industry. 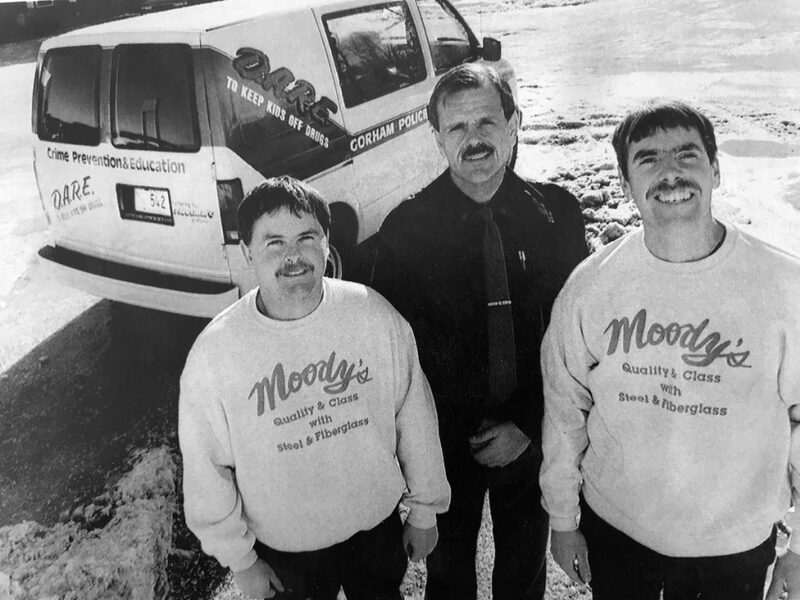 Gorham businessman Shawn Moody, right, poses in January 1995 with his body-shop manager Daniel Marean, left, and Gorham police Officer Wayne Drown near a panel truck that Moody’s Collision Center refurbished for use as the town’s D.A.R.E. vehicle. Soon his operation was deriving revenue out of its waste streams, recycling Freon and precious metals out of the cars and – in the mid-1990s – attending car auctions with a tablet-size computer that could immediately calculate the value and open orders for the parts on a given car. “When the vehicle came in the dismantling bay, we would only take off the parts we needed and left the parts that we had in duplication or weren’t going to sell,” he says. Competitors using paper index cards had a hard time keeping up, especially after the firm received a 1994 Gold Seal Award for Environmental and Operational Excellence from the national industry association. In 1998, a Chicago start-up, the LKQ Corp., got wind of Moody’s yard. Founded and funded by former executives of Waste Management Inc., the firm sought to consolidate the fragmented used auto parts industry as their previous employer had done with garbage hauling. Galvin met with Moody, toured his 30-acre site and liked what he saw. “We were impressed by the cleanliness of the property and the way he ran the business, because we weren’t a junkyard company – we were a professional business, and if people weren’t running theirs properly and handling their liquids right, we stayed away,” he says. Moody, Galvin recalls, was a shrewd negotiator, sometimes giving the impression he wasn’t following along, only to reveal in later questions “that he was two steps ahead.” Moody soon had a competing offer from Ford Motor Co., one his Uncle Jim and attorney, Peter Webster, urged him to take. But LKQ was offering stock equity at the ground floor, wanted him to keep running the company, and had already acquired businesses Moody respected. He turned Ford down. Moody has said the 1999 deal was worth millions, and that his stock portion tripled its value over the next three years. It also allowed him to travel the country, helping LKQ identify and recommend business improvements at other used auto parts businesses they acquired in Wisconsin, Texas, Florida and California. But less than two years later, Moody told his bosses he was leaving to focus on building his original business, now a collision repair outfit, which had continued to operate. “I was sad to see him go, but I understood what he wanted to do,” Galvin says. Since 2001, Moody’s Collision Centers grew from the single shop in Gorham to 11 locations from Augusta to York, with 200 employees who collectively own a third of the company via employee stock ownership benefits Moody created in 2003. “The Holy Grail is to have everybody think like an owner and to do the little things, the little extra to make sure the customers and their vehicles are taken care of,” says Moody, who co-founded a statewide association of businesses that feature such plans. He says the company’s books are open to all employees, who also collectively receive 10 percent of the company’s after-tax profit. He ran as an independent, garnered 5 percent of the vote in a five-way race that LePage won by only a 1.7 percent margin, and earned the admiration of many Mainers who responded to his optimistic, folksy campaign style. The day after the election, he says, he went right back to work at his business. In 2014, Moody stayed out of the race, though all three candidates tried to get his endorsement. He voted for LePage, he says, because of what he’d done to restore the state’s fiscal health, though he says that on a personal level he also liked the other candidates, independent Eliot Cutler and Democrat Mike Michaud. He has still never held elective office, but in 2014 LePage appointed him to the boards of both the University of Maine and community college systems. Over the past four years he gained some firsthand experience in public nonprofit governance, helping encourage collaboration between the systems and manage a serious enrollment and administrative crisis at the University of Southern Maine. 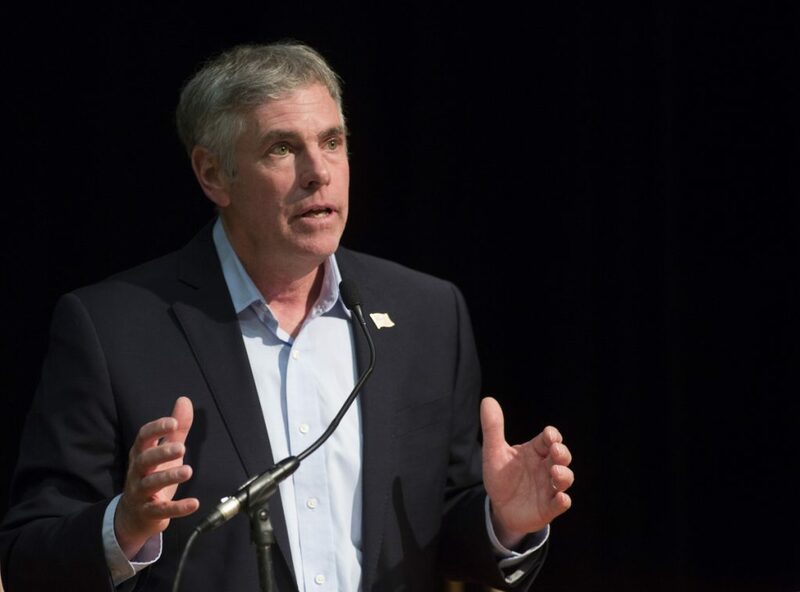 Republican gubernatorial candidate Shawn Moody of Gorham speaks at a primary forum at St. Joseph’s College on April 25. The only public poll to date – released Aug. 8 – has him in a dead heat with Democratic nominee Janet Mills in a four-way race for the state’s highest office, a long, nearly uninterrupted climb for the 12-year-old left alone in the house on Route 202.